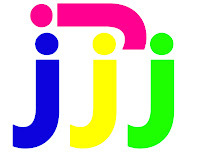 Welcome to the Letter J. 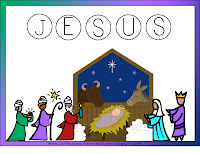 Since we’re nearing Christmas, I wanted to focus on the reason for the season: Jesus! Hope you enjoy it! Read Chicka Chicka Boom Boom and put up the letter J on our Alphabet Tree! You can download my small alphabet letters here. 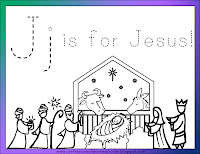 Jesus Coloring Page: We color this, paint it, or use markers. I found some that fit my 3 year old well, they’re called Pip-Squeaks Washable Markers. They’re shorter and easier for her to use. 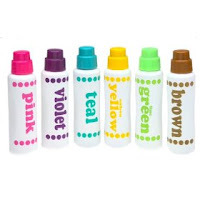 These pictured are chubby markers, they also make a skinny version. I got mine at Wal-mart. 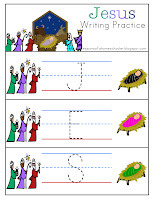 Jesus Writing Practice: Print and practice your letters with crayon, pencil, marker or laminate and use with dry-erase markers. J Tracing Card: This is new, I made it for kiddos who aren’t quite ready for my pre-writing or writing practice books. Its large and easier to trace. 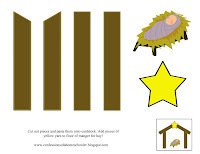 Jesus Size Sort: Put these in order small to big or big to small then discuss which is largest, smallest and medium. 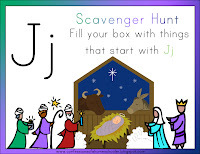 J Scavenger Hunt: Fill the box with things that start with J! Some ideas: jar, junk mail, jelly beans. 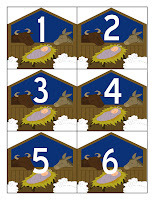 Jesus Puzzle: Cut along the guides for a fun 6 piece beginner’s puzzle! 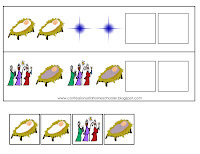 Jesus Pattern Activity: Just use the pieces to practice pre-math pattern skills. J Pre-Writing Skills: I laminate this and use with a dry-erase marker for pre-writing practice skills. You can also print this in grayscale and use for more scissor skills practice! Jesus Lacing Card: I make sure to laminate this one for durability, then punch with a hole punch every inch or so for lacing practice. Teach them patterns to do with this as well, like up from the bottom each time, or in-out-in-out sewing. Whatever pattern you can think of. 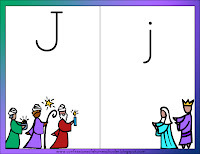 Capital/Lowercase Jj sorting: Simple, just sort the uppercase and lowercase letters. 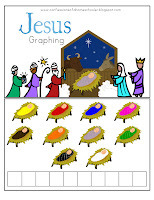 Jesus Graphing: I laminate this and then have them either color in the dots with dry-erase marker, or put bingo markers on it. 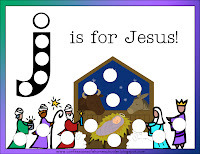 You could also use the little stars I provided in the Jesus Number Cards game below. Jesus Floor Numbers: I made these large floor numbers so that we can play a hopscotch type game. I call out a number and she jumps to it! You could also have them put the cards in numerical order. J Do-A-Dot Worksheet: We use Do-a-Dot Art Markers with this! 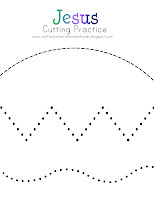 Jesus Cutting Practice: Simple print and let your child try cutting along the lines! Jesus Cut and Paste: This is a new one, (Your child may need help cutting some of the smaller pieces) Cut out and glue onto blue construction paper. Decorate with a star stamp in the sky, or cotton balls for clouds! You can also add yarn on the floor for hay! Jesus Counting Cards: I use these with either mini-clothes pins, colored paper clips, or put a hole in them and have her attach chain links to them. This time I made little stars to put on the cards. Whatever you use, just have them put on the correct amount for the number on the card. These are also good for putting in numerical order. 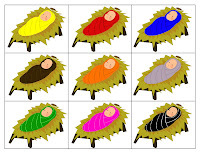 Jesus Color Puzzles: I cut these little guys out then cut them in half in as many interesting ways as I could think of to make tiny color matching puzzles. 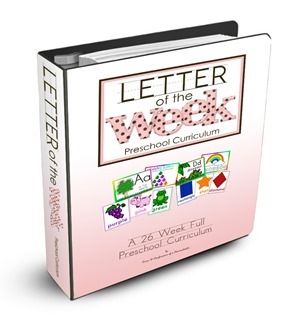 I included in pg2 of this download the color words on a grid as well, so you can have them match the correct color to the word. Finger Tracing Paint Bag: This is simple and fun, I filled a bag with tempura paint, you could also use cheap shaving cream. Then I’ll tape it to her desk for her to practice writing her D and d in using her finger. 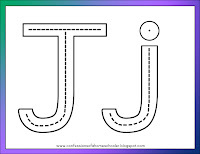 You could also skip the bag and put shaving cream on your counter if you’re feeling brave ;o) After we do the letters we do numbers, shapes, and whatever else we can think of! 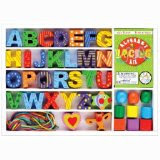 Color Cubes: I found a new use for our Large Alphabet Lacing Cards! First we traced the letters with her finger, then we used our 1″ building blocks to make the letter D and d. She also picked 2 colors of blocks and did a pattern as she made her letters! We also use them for lacing practice, but this was a new variation since I’ve been making the shaped lacing cards too! 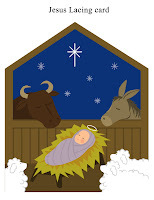 Felt Nativity Scene: My kids love this and play with it year round! Sadly, we don’t have a ‘real’ felt board, I just got some cheap black felt and are you ready? Yes, used duct tape to tape it to the back of a piece of board LOL! They free play, or set up the scene as you read to them! Family Fun Night: Have some bread with Jam. 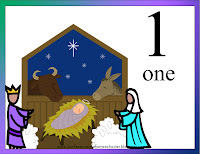 What a great unit – perfect for Christian preschoolers before Christmas. I'm new to your blog, and love it! I will be getting together this unit this weekend to do next week, Thanks! 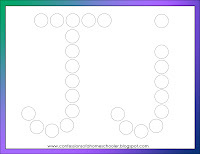 !I was wondering, what are your favorite homeschool manipulatives, tools, etc. that you have bought, and what are those that you feel were a waste of money? Thank you! Your blog is such a blessing to me and my family. 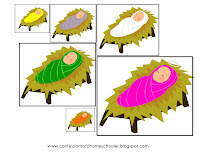 My preschooler will love these and they go perfectly with our Christmas theme! Again, thank you! Hi, I think the most frequently used items I've purchased are the Kumon Wipe off cards, everyone loves to do these for some reason! 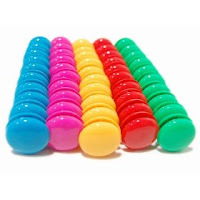 We also like all the extra stuff in this post like the do-a-dot markers, geoboards and magnets. We use those all the time! I also like file folder games and lapbooks, the kids like doing them. I can't think of anything I've bought that we haven't used, but mostly we like things we make ourselves, motorskills manipulatives etc. best of all they're cheap! I just found your blog and LOVE it! Your craft and activities are wonderful! I've added your button to my blog and look forward to seeing more of your posts. I just love reading about everything you do every week. You have some of the greatest activities. Love them all!